Brexit will put further pressure on Macy's near-term sales trends, but there could be offsetting benefits. Department store giant Macy's (NYSE:M) doesn't operate any stores in the U.K. -- or anywhere else in Europe. That will spare it from any direct damage related to the recent U.K. referendum to leave the EU. However, this doesn't mean that Brexit will have no impact at all on Macy's. Brexit could weigh on Macy's revenue and earnings by further reducing its sales to international tourists. Yet Brexit could also benefit Macy's by increasing the value of its flagship real estate properties just as the company is gearing up to monetize these key assets. Brexit may negatively impact Macy's sales to international tourists. Image source: The Motley Fool. One cause of Macy's recent sales woes -- though not the only one -- has been a decline in sales to international tourists. Macy's (including its upscale chain Bloomingdale's) has a handful of large stores in major cities that have historically been tourist attractions. In the past year and a half, the strong dollar has cut into international tourists' purchasing power, causing them to spend less at Macy's. Indeed, last quarter, Macy's reported that spending on international tourists' credit cards was down 20% year over year, on top of a 21% decline in the same quarter a year earlier. Macy's executives were already losing confidence in their ability to stem these declines before the Brexit referendum. The vote to leave the EU will make things worse through its negative impact on the British pound. 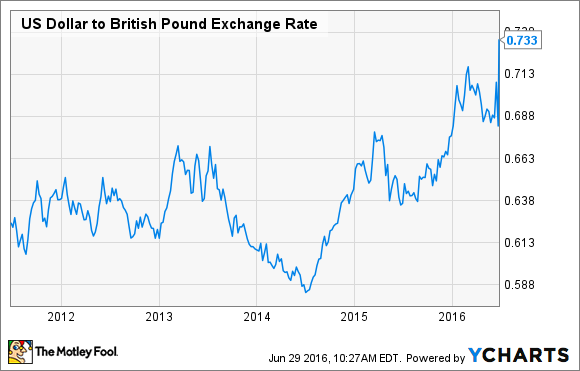 The weaker pound will give British tourists less purchasing power in the U.S. Furthermore, the International Air Transport Association estimates that Brexit will reduce outbound travel from the U.K. by roughly 10% by 2020, impacting the number of tourists visiting the U.S. Finally, the weaker pound is expected to stimulate travel to the U.K. For tourists globally, the relative cost of taking a trip to London compared to a trip to New York or San Francisco has now declined. If the U.K. "steals" tourists who might otherwise have traveled to the U.S., that would further dampen Macy's sales to international tourists. On the bright side, Brexit may bolster the value of Macy's real estate portfolio. In recent years, foreign investors have poured tons of money into real estate in key global cities -- including London -- seeing high-quality real estate as a safe store of value. The current turmoil in the U.K. makes London's real estate market a lot less attractive. This could drive up values for both luxury apartments and commercial real estate in top U.S. markets like New York and San Francisco. If economic risks from Brexit cause the Federal Reserve to keep interest rates low, it would also be a positive for real estate values. Macy's owns a handful of stores in major urban centers, highlighted by flagship stores in New York, Chicago, Minneapolis, and San Francisco. A recent analysis sponsored by hedge fund Starboard Value pegged the combined value of these properties at $7.3 billion. That's very significant compared to Macy's market cap of a little more than $10 billion. Brexit could increase the real estate value of Macy's flagship stores. Image source: The Motley Fool. Macy's is actively looking to monetize its most valuable real estate assets. For example, it may downsize some of its flagship stores and then sell off the upper floors to investors or real estate developers or form joint ventures to redevelop the unused space. If Brexit leads to a surge in demand for high-quality real estate in major U.S. cities -- it's worth noting that not everyone agrees that it will -- Macy's may have picked a great time to market its iconic real estate assets. By contrast, investors probably won't learn much about Macy's real estate initiatives in the near term. Big real estate deals typically take a year or longer to come together. Macy's is more likely to announce its plans for its most valuable properties in late 2016 or 2017. Given that real estate now represents far more of Macy's value than its retail operations, Brexit could ultimately have a neutral or positive long-term impact on the company's value. Thus, Macy's shareholders should be patient even if sales trends dip further this summer.